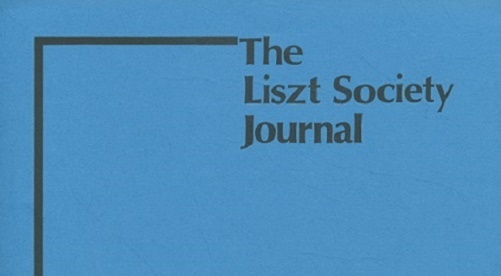 The Liszt Society's Journal is a learned treatise which is published annually for distribution only to Society members. Its contributors are drawn from around the music world and are amongst the most respected musicologists, academics and musicians who share a particular interest in all aspects of Liszt's life and works. Today's journal came into being in 1975 as a successor to the Society's early annual newsletter. In those days the newsletter appeared once a year and was much larger than today's format. It seemed natural to formalise the early newsletter content into a separate journal publication, thereby leaving such items as news, reviews, announcements, opinions etc, which by their nature are more transient, to a smaller document which could be published several times a year. The Journal is published in October/November and is distributed as a bound document of typically 100+ pages, together with a companion music section. The music section first appeared in 1988 and offers members their own source of otherwise unobtainable Liszt piano works, selected from the archives by the Society's President Leslie Howard. The Music Section distribution is limited strictly to Society members and its content is not otherwise publicly available in published form. Please note that only the contents and cover pages of past journals can be downloaded from this page. Society members can request back copies of earlier journals which may be made available for a modest fee, depending on availability of the original source.